Of course, amore mio, and I came up with this — now one of our favorite meals, especially for lunch in warm weather. It’s so very simple and delicious, and even great cold as a salad IMHO. Feel free to add whatever you like, including pancetta. Yum. 1. In a medium pan, saute onion in olive oil over medium heat. 2. Add peas and water to pan, and let cook until tender (depends on peas, but can take anywhere from ten minutes and up), adding salt to taste along the way. 3. When the peas are nearing done, put on water for pasta and when it comes to a boil, add salt and prepare pasta. 4. Strain pasta and add to pan with peas and toss together well. 5. Add a drizzle of fresh olive oil and top with lots of freshly grated parmigiano. This sounds (and looks) so good. Next time I go to the farmers’ market I must buy some peas. .-= nyc/caribbean ragazza´s last blog ..Nuns, Jesus and mammograms =-. Oh Michelle, that’s one of my favourites! We do it with smoked pancetta and it is delicious. You’re so right about the short pasta, pastina is best with this, it doesn’t work well with anything else I don’t think. That has just put me in the mood for it now! .-= jo mcgilp´s last blog ..Sunshine and Barbecues, you just have to, it’s law! =-. I just made some pasta and peas on Monday but I made it with a creamy sauce. I will be trying this simple recipe next time. And I gotta get some fresh peas. Yum! My Mum makes this all the time, we have it with fresh ricotta through it…yum! So simple yet so yummy. 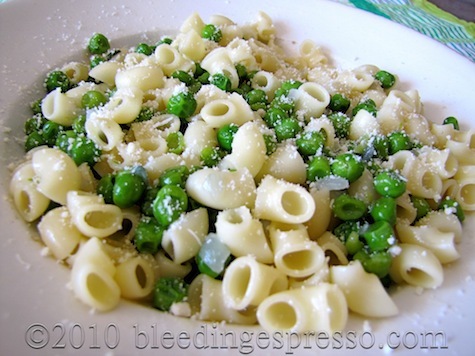 I love simple ricotta tossed with pasta…may have throw in peas next time! I made this Sunday – simple and lets the taste of the fresh, spring peas shine. .-= Claudia´s last blog ..No-cook appetizers for my spring of amazements =-. Seems simple enough. My little one will surely enjoy this. .-= jen laceda´s last blog ..World Cup Rates from Design Hotels™ =-. It does my heart good to see so many people still cook. Really, truly! I put in cream as well. A simple but delicious combination. .-= LindyLouMac´s last blog ..Five Seconds of Fame =-. this is one of my favorite dishes…my mom use to make it all the time when I was a little girl. .-= The Food Hunter´s last blog ..Nordicware Baking Sheet Review, Mostaccioli Cookies, & Giveaway =-. I love pasta and peas!! It’s actually a dish I grew up on. I’ve never had it “white” though – my family always made it with marinara. I have never used fresh peas but I find that frozen are “fresher” if you will, than canned. And I really like “Italian Mama Chef’s” suggestion to make it creamy. I’ll have to do that next time. Well, the time after I make it your way, that is! Excellent. Making my market list for tomorrow a.m. & peas it is. And though this would be easy to cut in half, I always appreciate a recipe for two…thanks, M.
.-= Susan´s last blog ..Tales of the Islander =-. My mother used to make peas with shells in a broth. While cooking some of the peas ended up in the shells. This was back in the 50’s and we lived in a new development three or four, maybe five, houses and road wasn’t even paved yet. All of the kids on the street played together and when it was time to eat my mother and one or two of the other mothers just fed who was there. No one got sent home because the family was about to eat. Most of my mother’s meals were more than enough for the family or she just added more ingredients if extra guests showed up. There was a family up the street from us, he was Sicilian and she was Greek and they had two sons around the age of my younger brother and sisters and a baby daughter. One of the sons just loved shell and peas and my mother gave her the recipe. He saw when he first saw her cooking shells and peas he said she was doing it wrong. He told his mother that Mrs. M. put the peas in the shell! He then had his poor mother inserting the peas in the shells – one by one!!! Hahaha I *love* it Gil! Looks scrumptious. I love peas in almost anything. That dish looks sooooo yummy!!!! o m g, i’m literally licking my lips!! .-= Prem´s last blog ..BBQ marinades =-. This looks perfect for this time of year. I love its simplicity, which must make the flavors pop. 😉 Yum! This is becoming a weekly dish at our house, Chris; hope you like it! I have something similar with a cream sauce as well, which I like with bowtie pasta. Now I want to try this. YUM. Hope you like it, J! .-= J´s last blog ..Thank You =-. grazie mille per questa ricetta, Michelle! I made it yesterday and it was delicious! I love the simplicity of it, without the heaviness of a cream sauce. I used frozen peas and gluten-free pasta for my son, and he added tuna to his portion, which also turned out well. So happy to hear you and your son enjoyed it Marybeth; I think it would be great with tuna indeed! Looks wonderful … I’ve never thought of using the shorter pasta before. I have a similar recipe, which I learned it from my professor, who is a milanese. Basically the same recipe, except he sometimes used spaghetti broken in two, and he used a yellow onion instead of a red one. Sometimes he would also add a little tonno packed in oil to the peas and onion about 3 minutes from the end, and in that case he would leave off the parmigiano. I love this as a quick lunch. He used to serve it preceded by a light plate of bresaola with olive oil and black pepper and then a very good coffee made in the moka afterwards.